ordnet Deportation in ein Konzentrationslager an. (Illustration: Criminal inspector and SS main storm leader "Hirschberg"
Hauptstaatsarchiv Hannover, Akte Hann. 86 Celle, Acc. 142/90, Nr. 39/0548, Blatt 17. Betrifft: Gorath, Karl, geboren am 12.12.1912 in Dreibergen. Gegen Gorath habe ich mit Wirkung vom Tage der Strafverbüßung polizeiliche Vorbeugungshaft angeordnet. Ich bitte, Gorath mittels Sammeltransportes nach dem Polizeigefängnis Bremen-Ostertor überführen zu lassen. Ein Transportzettel ist beigefügt. Der Transport in das Polizeigefängnis erfolgte am 18.12.1942. Von dort ging es am 30. Januar 1943 in das Konzentrationslager Neuengamme bei Hamburg. Main Federal Archives Hanover, file Hann. 86 Celle, Acc. 142/90, Nr. 39/0548, sheet 17. Concerns: Gorath, Karl, born on 12-12-1912 in Dreibergen. I have ordered police preventive custody with effect of the day of the dismissal against Gorath. 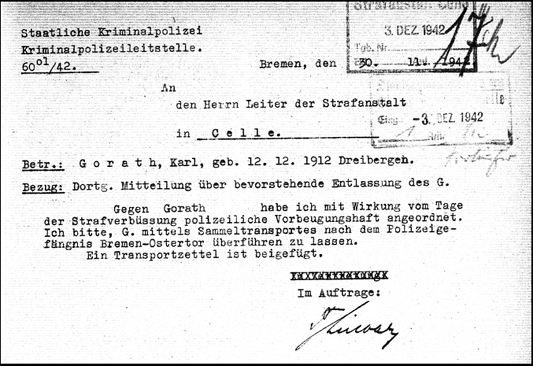 I ask to hand over Gorath in group transport to police prison Bremen-Ostertor. A transport piece of paper is enclosed. (According to proof in the Federal Archives Coblenz, file R 58, 423, sheet 12, head of the criminal department Wesermünde - earlier name of Bremerhaven -, SS main storm leader and criminal inspector. The transport to police prison was carried out on 18-12-1942. It went on from there into the concentration camp Neuengamme near Hamburg on 1-30-1943.